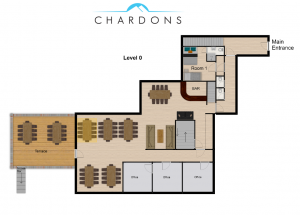 Chalet Chardons is a simple yet comfortably furnished hotel in Tignes Les Brévières with up to 56 beds available. 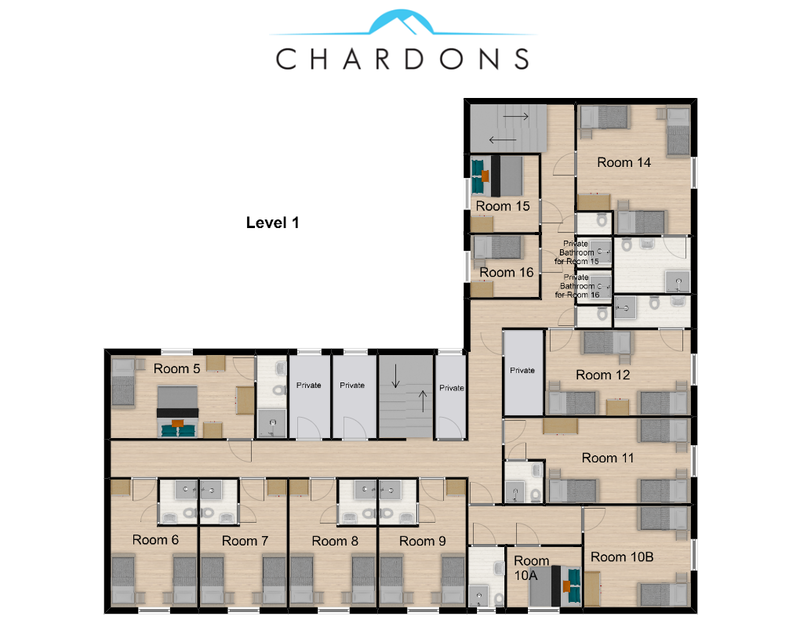 The Chardons is primarily aimed at budget minded skiing and snowboarding enthusiasts looking for an affordable ski or snowboard holiday. 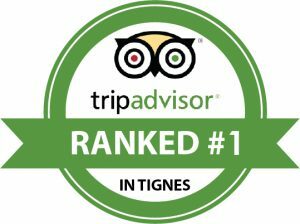 Chalet Chardons is ranked Number 1 on Tripadvisor in the whole of Tignes. 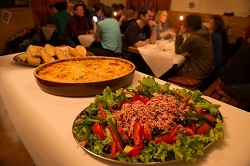 We would like to think that this is down to excellent food, good company, great access to the lifts and the best possible value for money in the Espace Killy. We are very proud of our reputation as we are in competition with many far more luxury and expensive chalets. I had the pleasure of staying in Chalet Chardons for 8 weeks as a long stay guest. 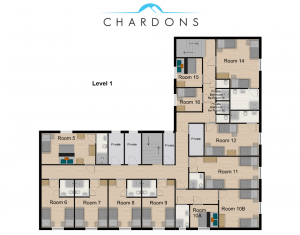 The accommodation is clean, great value for money and has easy access to the lifts. In particular the staff were fantastic. A special mention to Adam, Aaron, Jack and Ollie in the kitchen, and Francesca, Lucy, Thea, Dom and Will for cleaning and serving breakfast and dinner. The staff in the office were always approachable, friendly and helpful. I had a brilliant time and can't wait to come back in the future. Second time staying in chalet chardons. Really great value for money. 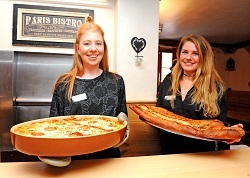 Loads of great quality food for breakfast and evening meal, you certainly won't go hungry, with an unlimited amount of hot or cold drinks available all day and some delicious cake available when you get in from the slopes. 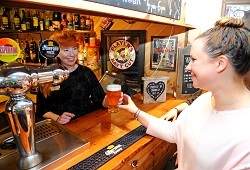 Really friendly atmosphere with all the other guests and staff who are also really helpful. Thanks for another great week! I spent a great week dining at the Chalet Chardons. I was actually staying with my son Andy and his partner Nell in Viclaire, but made arrangements to eat at Chardons each evening. The Chalet is in the middle of Tignes Les Brevieres, in the same block as Le Moose bar and across the road from the Boot Room - both very popular bars. I'd enjoyed myself at Chardons in 2018 and 2019 proved to be better still. The staff are super friendly, the place is well run, and the food is top notch. Hats off to Tracy and her team - chef, hosts and everyone else! If I had to pick out one aspect it would be the rotation of seating at dinner. Every night, the hosts would shuffle the seating so I ended up meeting everyone who was staying there. A group of 7 of us stayed at the Chalet Chardons in April. This is my 3rd time staying here and it never disappoints. All the staff are so friendly and accommodating and the food is amazing. 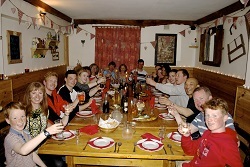 Thank you to Tracy, Rory and Katy who were the chalet hosts. The images on this page are all photos taken within the Chardons hotel and represents food actually produced by our highly trained staff at the Chalet Chardons hotel. 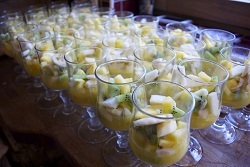 Chalet Chardons food is one of the highlights of your holiday. We believe that skiing and snowboarding should be about getting fresh air, exercise, thrills and spills… and then coming back and completely spoiling yourself! 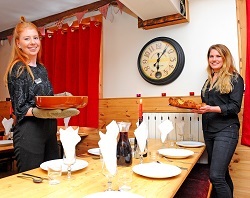 Chalet Chardons hotel offers a simpler menu than the smaller chalets consisting of classic dishes designed for hungry skiers and snowboarders who’ve done a hard day’s sport. 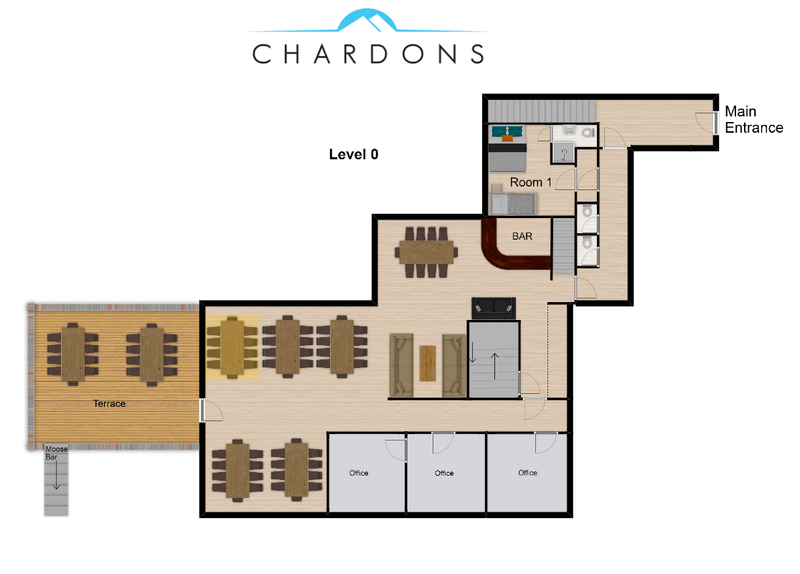 At Chardons restaurant quality breakfast, afternoon tea and a three-course evening meal with complimentary wine, all meals are taken in the dining area in a communal setting. Breakfast has a selection of French pastries, freshly baked baguette, preserves, yoghurt, fruit, choice of cereals, tea (PG tips), freshly brewed coffee, juices, porridge cooked to order and a different hot option daily (for example, one morning we offer sausage, scrambled egg & tomato; another morning we offer grilled ham, hash brown and mushrooms). Afternoon tea is served from 4pm and consists of delicious freshly baked cakes, tea (PG tips), selection of herbal and fruit teas, freshly brewed coffee and hot chocolate all available until dinner. Tea and coffee are available throughout the day and after dinner. Dinner is served in the dining room of the hotel in a convivial setting – a 3-course or banquet style meal with cheese board once a week. Plentiful portions are served ensuring you will be well fed and nobody will leave the table feeling hungry. Children, vegetarians, vegans and special diets are all catered for. 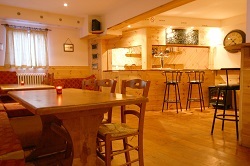 Just let us know at the time of booking and the menu can be discussed further with your chalet manager and hosts on arrival. If you have specific requirements (vegan, allergies, celiac) we would ask that you let us know sometime in advance so we can prepare and to bring any special foods with you as many of them can be very hard to source in France.